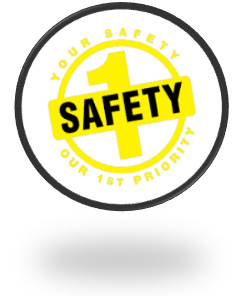 Safety is the number one priority for us here at Tradesmen Electric LLC. OSHA Regulations and guidelines are followed on our projects and we also maintain a drug-free work environment. All employees are drug tested and randomly checked throughout the year to insure everyones safety. All employees are required to attend the weekly safety meetings held at the jobsite they are on. We also have daily toolbox meetings to talk about safety and the task(s) for the day. We want everyone to be on the same page and we believe the job site will be safer and work will be more efficent by doing so. Here at Tradesmen Electric LLC we require our employees to wear steel-toe boots and safety glasses at all times, hard hats, hearing protection, and arc-flash gear when required. Each employee must have the correct and current certification when operating equipment on job sites (certification must be on person while operating equipment). An SDS book will always be available at our office and on each job site.